We’re wrapping up Fraud Prevention Month with this warning. Victoria police officers have seen an increase in reports of the ‘Inheritance Scam’ with a traditional twist over the past couple of weeks. 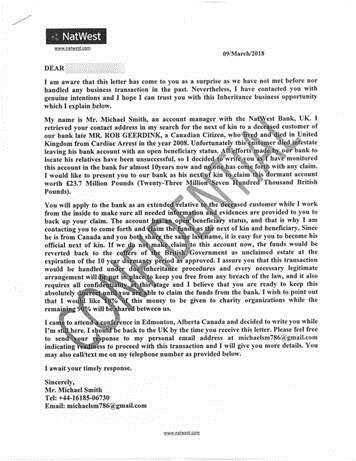 At least six people reported that they have received letters, through the mail, advising that a person with the same last name as the recipient has died, leaving over 23 million pounds in the bank. 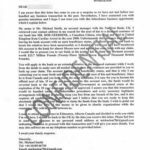 The letters indicate that the recipient should reach out to the bank and would be entitled to 90% of the funds with 10% going to charity. A copy of the letter is below. Note that the letters were addressed to each recipient individually and delivered to their residences. While introduced by hand-delivered letter, similar to email-based inheritance scams, recipients are asked to reply via an email address. While nobody has reported being defrauded in Victoria or Esquimalt in this scam, it is important to know that it is a scam and no bank would offer anyone money in this way. Recently, we haven’t seen scammers use hand-delivered mail as a method to target potential victims so while one might believe that the letter is legitimate, please know it’s not. For more information on this scam, or to report fraud online visit the Anti-fraud Centre.